Part 1: What Are Church Politics? The title startles us, doesn’t it? I guess the more friendly or much safer titles would have been, “How To Survive Church Politics” or “How To Understand Church Politics But Not Get Involved,” but here’s my titling dilemma. I don’t want to survive in my environment, I want to thrive in my environment and if I want to thrive I can not fully embrace church politics nor can I deny they exist and that puts me (us) in an awkward position. The title “Play Church Politics” suggests it’s a game we play and that feels a little discomforting too. We may think church or office politics don’t exist. I think it may a bit naive to assume as much and you may think, “I don’t want to play, let alone try and win!” I hear you, I am with you, I agree with you. However, if the game board is out and everyone is at the table ready to play, what do you do? How do you behave? Do you roll the dice when they are passed to you or get up and quit the game? After all, It’s an unhealthy game to play. Well, I think you should play. I think you should play but change your definition of what it means to win. If you get up and walk away from the game you are feeding into church politics in a big way. The goal of the person or people who are “Politicking” is to get what they want. So, if you walk away, they win, by their own definition. If you are truly after the greater good of your church or organization you must roll the dice and play. Question the rules, influence the outcome in a healthy way. We may not be able to precisely explain church politics but we can certainly feel their effect. Like a gentle wind blowing through the trees or a fierce storm raging through the culture church politics are more often felt by their devastating effects on others. However, we need to at least have a definition of “Politicking” and how it fits into “Church Politics” so let me give it a shot. Politicking is using a wide range of tactics to promote or leverage others in order to accomplish your own personal agenda or give biased support to someone else. In a word it’s selfishness. If you are new to the game here are a few things you need to understand. 1. I need to understand that church politics exist. 2. I need to understand how the game is being played. 3. I need to understand why the game is being played. 4. I need to understand when to need to engage in a healthy way. 5. I need to understand it’s not about me or my agenda. What Does It Mean To "Win" Church Politics? Winning something doesn’t mean you always come in first place or get the corner office or even keep your job. Winning means something different to everyone. Take Jesus for example: The enemy thought he won when Jesus died on the cross but the enemy didn’t win, he suffered a critical blow! Jesus died, yes, but did He loose? Of course not, He won! Not paying attention to or not playing church politics is exactly what those who created the game want to happen. To not play is unhealthy. Next time you see a game forming, grab a chair, pull up to the table, take the dice and roll. Just remember, your definition of winning comes from an unselfish place, not a selfish one. Your goal is to gain perspective, understand and collaborate. Their goal is to control, manipulate and leverage their own agenda. Play with grace, humility and unselfishness today. 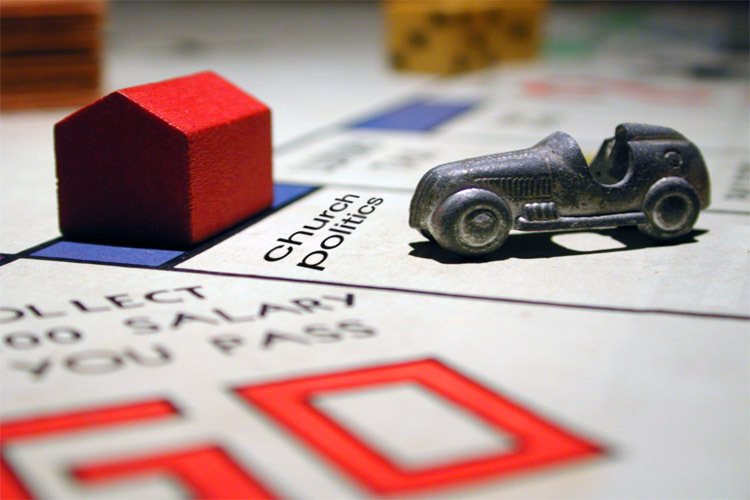 Have you ever played church politics? Do they exist in your church? How do you know they exist in your culture?